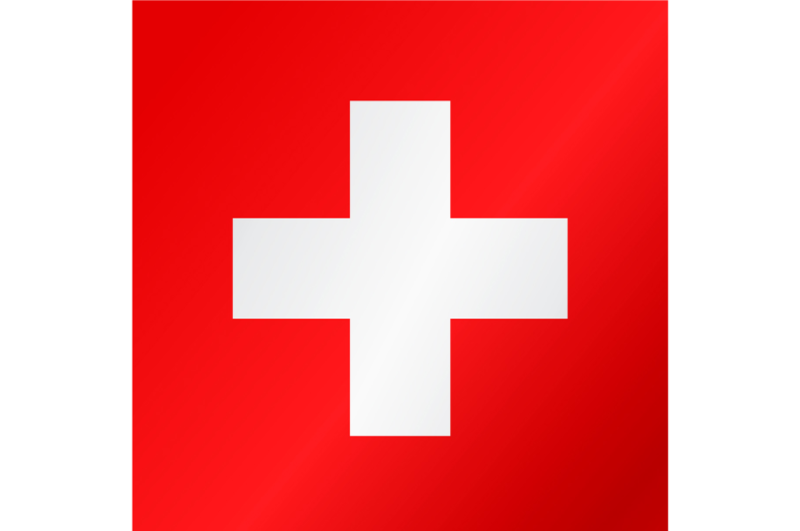 Ski resorts in Switzerland are generally very high meaning, of course, some very high altitude ski areas with excellent skiing conditions and guaranteed snow! There are, however, many glacier ski areas if ever the snow is wearing a little thin at the end of a long season. Like everything in Switzerland, the ski slopes are perfectly maintained and the lifts are very modern and efficient, giving Swiss ski resorts just that little extra plus point in comparison to some of its neighbouring alpine countries! Many of the Swiss ski resorts are linked together by efficient lift systems, giving access to huge ski areas with only one ski pass. For example, in Verbier, the ski pass covers the whole of its Les Quatre Vallées including the resorts of Haute Nendaz and La Tzoumaz, opening up access to all tastes and levels. The world famous Swiss ski resorts of Davos, Klosters, St. Moritz and Flims, Laax & Falera make up the vast 7000 km² Graubunden ski area. Not even the most demanding skiers could get bored in Switzerland! 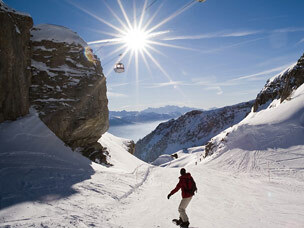 Among the best ski areas in the Swiss Alps for snowboarding is the famous ski resort of Verbier. Host of the Freeride World Tour, Verbier is a top snowboarding holiday destination and is great for both intermediate and advanced snowboarders looking for both on and off-piste challenges. Verbier is home to the Swatch Snowpark at La Chaux which has kickers, boxes, rails and a big airbag - more than 20 structures in total! The park has a “chill-out zone” where you can watch yourself on a large video screen – if you dare! 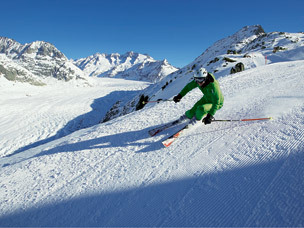 Verbier’s ski area also has only 10 drag lifts which makes it a perfect ski area for snowboarders, in particular beginners and intermediates. The well-known Swiss ski resort of Saas-Fee is very popular for snowboarding - especially for beginners who need to gain confidence. There are plenty of gentle slopes to practice on and for the more advanced snowboarders, facilities include 1 terrain park, 2 half pipes, 1 quarter pipe and a fantastic boarder cross course. Considering Zermatt has 200km of its own ski runs and access to a huge 360km in total in the Matterhorn Ski Paradise ski area, it goes without saying that snowboarders will be in heaven, just like skiers, with this much terrain to cover. However, freestylers in particular will be thrilled at the sight of the 200m super pipe (among the longest in the world) at the Gravity Park in Zermatt’s own ski area. 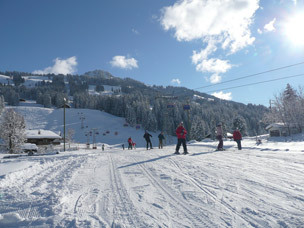 The region of Gstaad is extremely popular with cross-country skiers and is known as one of the top cross-country ski areas in Switzerland. The area is split into many different circuits all offering a different degree of difficulty and scenery. The Graubünden region, home to the famous ski resorts of Davos and Klosters and the Swiss National Park, is one of the most stunning places in the world to practice cross-country skiing. 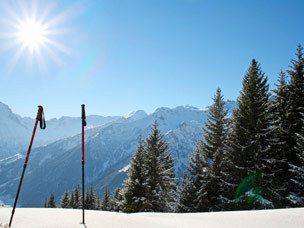 With around 200km of well-kept trails, this area is just paradise for cross-country skiing enthusiasts of all levels. The ski resort of Davos itself also offers beautiful, immaculately maintained cross-country trails that run through pretty landscapes and offer some challenging circuits for the more adept cross-country skier.